From the first European settlers in Virginia to the “huddled masses yearning to breathe free” at Ellis Island, our family tree is vast thicket of immigrants. In this year, 2013, when a new generation was added to our tree, it’s important to look back. There were thousands of individuals who left their native lands to settle in America, “The New Colossus.” They were English brush-makers, German farmers, Scottish chambermaids and Italian silk dyers to name a few. This expiring year, however, represented an anniversary like no other for my lineage. The hereafter mentioned dates represent the bookends for my ancestral immigrant experience. 1613* and 1913 are a beginning and an end. Francis Mason and Nancy Gray, whom came here in those years, were the first and last immigrants to America on my tree. * Note: As of 31 Dec 2013, I have identified Francis Mason as the earliest immigrant on the family tree. However, there are numerous Jamestown settlers, whom arrived as early as 1607, that could be linked to ancestors in Virginia but who’s ancestry cannot be ascertained because documentation did not survive or evidence has not been discovered. Genetic evidence is pending in many cases but until such time, Francis Mason is the earliest identifiable immigrant to any American colony in my case. 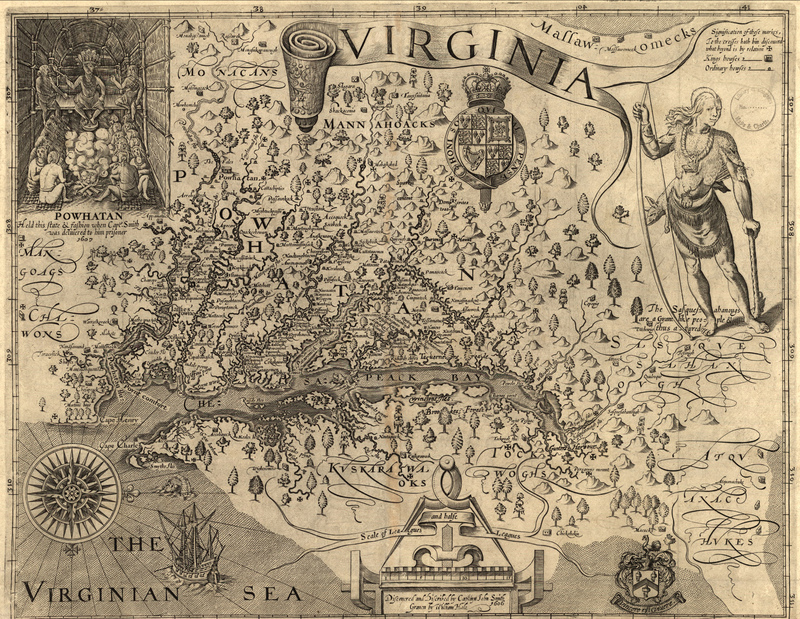 Four hundred years ago, when Jamestown began its ascent out of its chaotic and cannibalistic beginnings, the “second sons” of English aristocrats, seeking fortune or adventure, came to Virginia in larger numbers. In 1613, the ship John & Francis sailed from England to the New World’s shores. One man on that journey was a 30-year old planter from Stratford-upon-Avon, his wife and a young daughter. He was a “Cavalier and Adventurer.” His name was Francis Mason. Map of Jamestown and surrounding environs. In 1624, the inhabitants of Jamestown and the surrounding settlements were enumerated in what was known as the 1624 Muster Rolls. In addition to listing each colonist, the Muster Rolls contain data regarding age, the year of immigration and ship that brought them to Virginia (this is why it is referred to as the Muster Rolls), and other information such as livestock, guns, etc. Francis and family were among the colonists listed. Also among them were numerous servants. Francis was part of the third investiture of the Jamestown Corporation, which arrived in 1613 as the muster roll states. His first wife Mary died in Virginia before 1622 when, around that year, Francis Mason married Alice Gayney (who immigrated in 1622). Francis was invested in acres of land used to farm tobacco. About five years prior to his death, now Francis Mason, now a lieutenant, was patented 200 acres in Lynnhaven Parish. Francis and Alice’s daughter, Elizabeth, married “a rich and prominent” French Huguenot emigrant James Thelaball. James has the nefarious distinction of being an importer of African slaves. Lynnhaven, Princess Anne County and nearby places like Portsmouth and Norfolk would be home to this branch of the family tree for two hundred years until my fourth great-grandfather, a Presbyterian minister, removed to New York. He refused to preach to slave-holding men as he saw slavery as a sin and evil. Take that Thelaball. 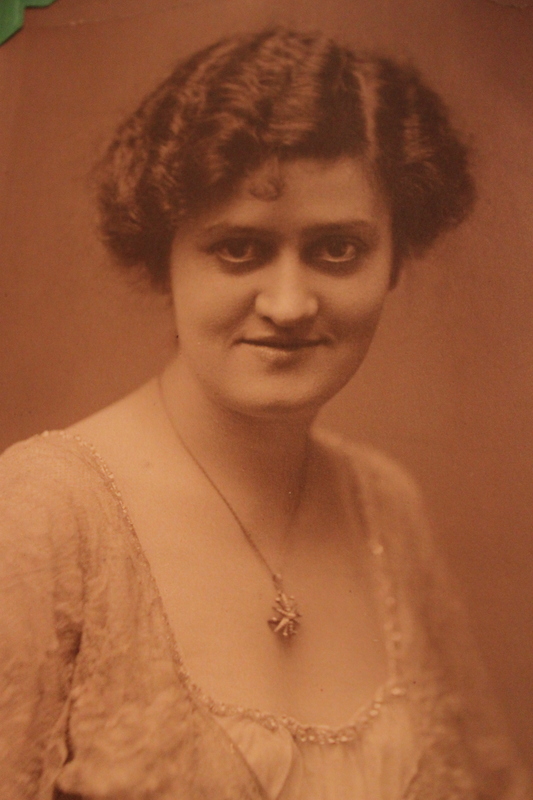 My great-grandmother, Elizabeth Ann Gray (1883-1968). Three centuries later, millions of Europeans were arriving in New York. These new arrivals were “processed” daily and sometimes these poor souls were detained. Their names were often mangled by immigration officers, the original version of their names sometimes lost to history. Half my lineage (my maternal great-grandparents) passed through Ellis Island during the early 20th century. My Italian family, the Venturinis and Bighinattis arrived in 1907 and 1909, respectively. Two years after the Bighinattis, my Ulster-Irish great-grandfather Robert Seymour arrived. In 1913, Robert’s future wife would immigrate to the United States. Born in Glasgow, Scotland in 1883 to Airdrie-born blacksmith James Steele Gray and his wife Jane Condie, Elizabeth Annie Gray was the youngest of eight. Nancy, as she was called, was employed as a servant in England just before coming to the United States. If you are thinking Downton Abbey, that’s an appropriate parallel. Just like Francis Mason, she was 30 when she traveled to the New World. On her voyage to New York, aboard the ship Oceanic, my great-grandmother was accompanied (as implied by the passenger manifests and employment papers) by a valet named Robert Denyer. Mr. Denyer was from Highbury in North London (ironically, Highbury was home of my favorite English football club, Arsenal) and he was headed for the same employment office in New York as Nancy. However, they may have been closer than just acquaintances. Years later, my great-grandmother told members of my family that she was engaged when she left Britain. While on the Oceanic, she either reconsidered marrying that man or was broken-hearted, making the decision to throw her engagement ring off the ship and into the sea. I admit, the story is Titanic-esque, but you can take my word for it, I heard the story prior to 1997 when the movie was released. Was Mr. Denyer that man or was he the reason she wouldn’t marry a previous suitor? Unfortunately, I’ll probably never know the true story. She would first make her way to Ohio and was in the service of a wealthy family. Mr. Denyer became a valet for a very famous man. That man’s name was Alfred G. Vanderbilt. Yes, those Vanderbilts. Vanderbilt and Denyer died while assisting woman and children off the Lusitania before it sunk. Curiously, Nancy was back in New York the next year. Soon after, she married Robert Seymour. Suffice it to say, there is so much more to write about her that would be too extensive for this piece. I will save that for another time. My immigrant ancestry closed when my great-grandmother arrived but it continues on with others. This being an important year for immigrants in my family, my first child just happened to “arrive” this year. His ancestry boasts immigrants closer on the tree than mine. His grandmother is an immigrant, as is his uncle. The odds are quite high that his spouse could be an immigrant. Of course, in this ever-shrinking world, he himself could be an emigrant! One hundred years from now, Earth’s immigrant could be more wild than any of us could possibly imagine. Here’s to Francis, Nancy, anyone in between and anyone to come who made or will make the courageous journey to leave what they once called home and explore a new frontier.